A great performer, 12 tracks by important authors and composers, plus the sound of Umiliani's orchestra! A great performer, 12 tracks by important authors and composers (Fiorenzo Carpi, Pier Paolo Pasolini, Franco Nebbia, Alberto Arbasino, Goffredo Parise…), with an orchestra conducted by Piero Umiliani (who also features among the composers). 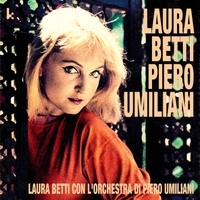 An album released in 1960 by Laura Betti (1927-2004), actress and singer whose name is tied to the work of directors such as Federico Fellini, Bernardo Bertolucci and especially Pier Paolo Pasolini with whom she had a longtime collaboration. Digital restoration & transfer: Riccardo Ricci (Ultrasonic Studio).